3 starke Songs (Hail hail, In my tree, Red mosquito), drei schwache Songs und mehrheitlich Durchschnitt wo man die letzte Nummer noch hervorheben muss. 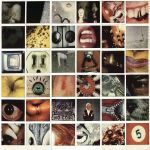 It's an awesome experimental album by Pearl Jam with a great maturity for them at the time.<br>Pity that during this era they were against doing promotional videos for the singles, that would've been interesting. Plenty of excellent songs on this album, 'Habit' probably my favourite.